At it’s base, where we parked, a huge campsite hosted hundreds of campers with deluxe tents. 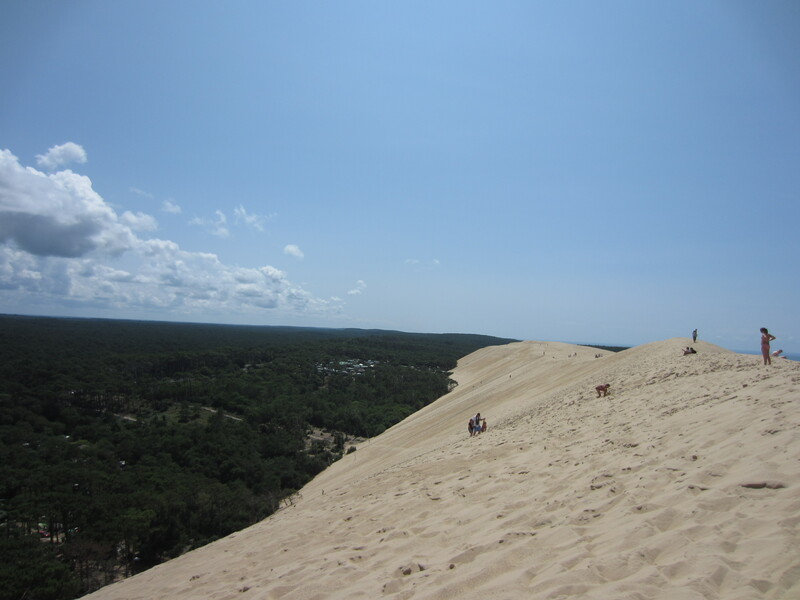 Weirdly, the dune met the forest directly, as if Europe morphed suddenly into the Sahara. 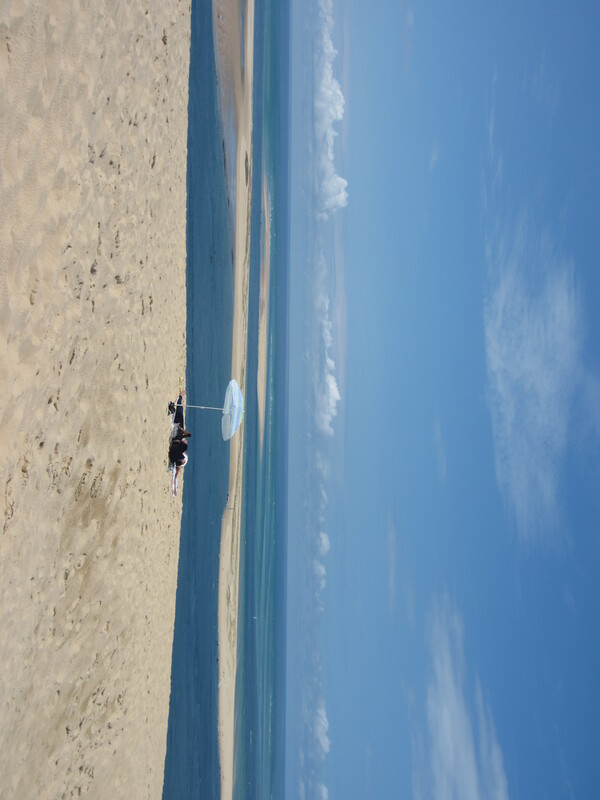 But this was the Atlantic coast of France, near Bordeaux. A steel ladder had been laid on the sand to help the climb. And luckily so – the sand was as soft and white as flour, and with each step, we would sink into the sand halfway to the knee. Even with the ladder to help, the climb was very steep, and with the midday sun overhead, baking hot too. But it was worth the mini-trek for the view at the top. 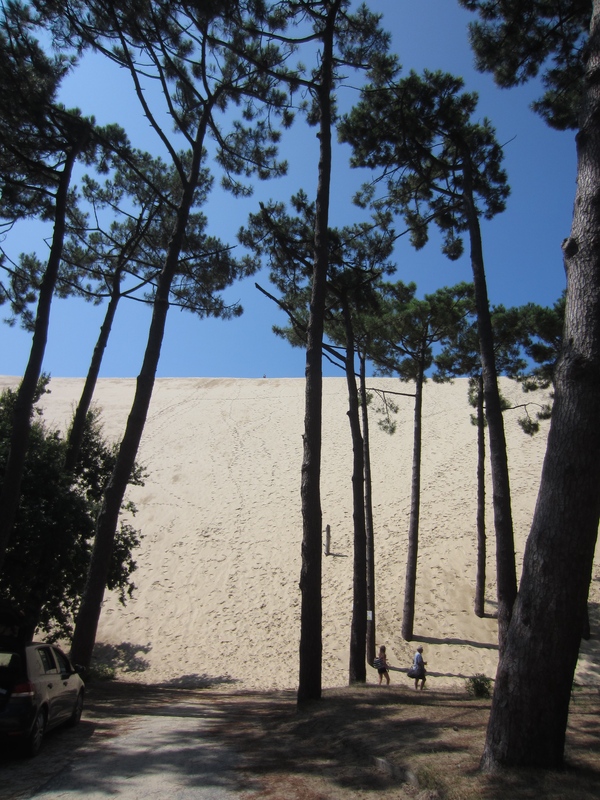 Standing on the crest of the dune, the pine trees below looked miniscule, and stretched as far as the eye could see. 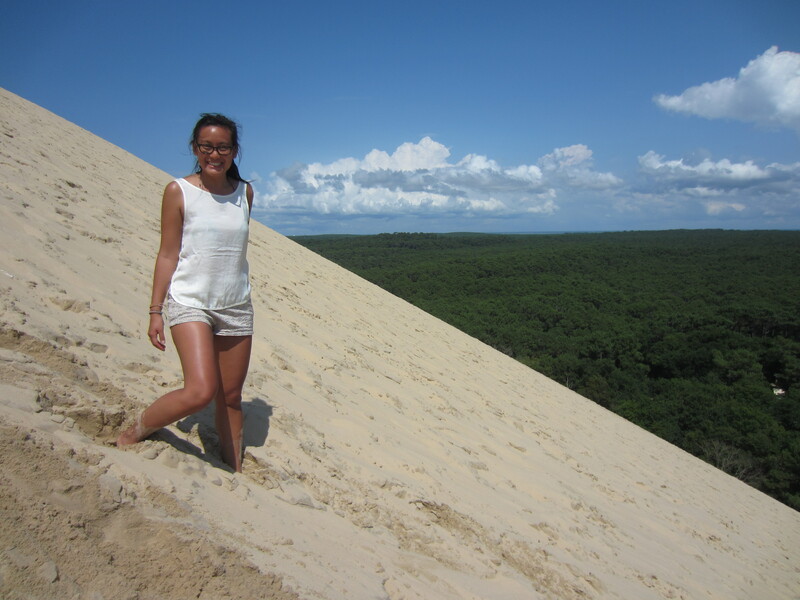 The dune itself looked endless, a 100m-high mountain of sand following the coastline for kilometers. On the other side, the ocean; turquoise waters and sand bars stolen directly from the Carribean. 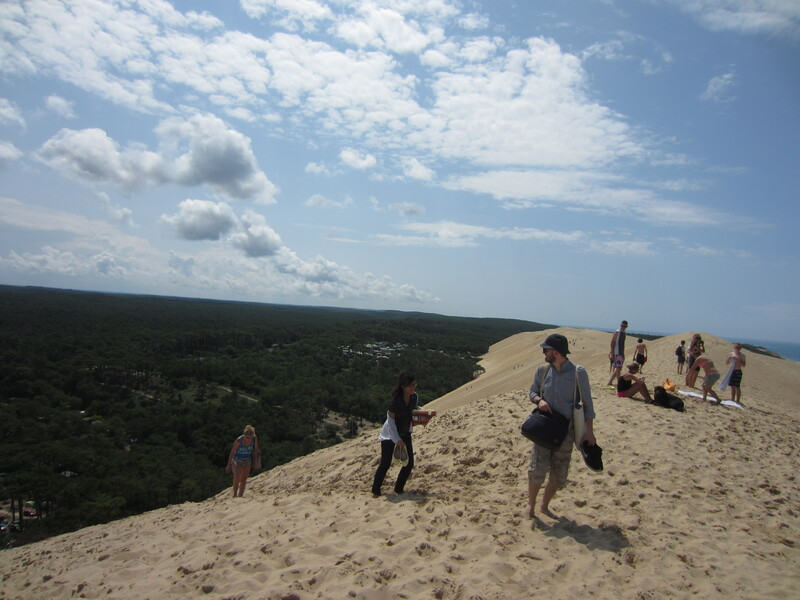 As if the dune was issuing an unsaid challenge to me, I needed to go down the other side. Going down was easy (and pretty fun). But because the sea-facing side was long, flat and wind-swept, climbing back was significantly longer that the ladder climb on the treeline side. And not really worth it, either – the shore was covered in seaweed and the beach wasn’t that nice. 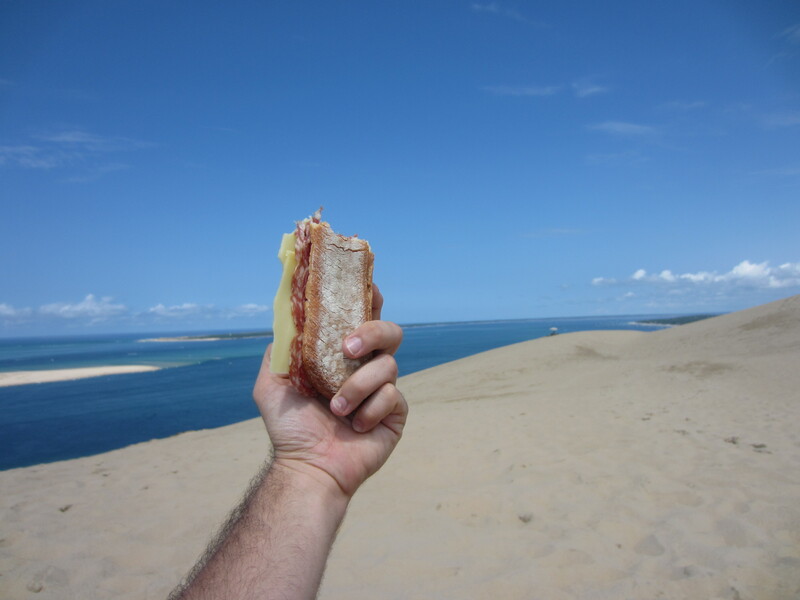 Tired, we sat under our umbrellas on the top of the world and ate baguettes with ham. 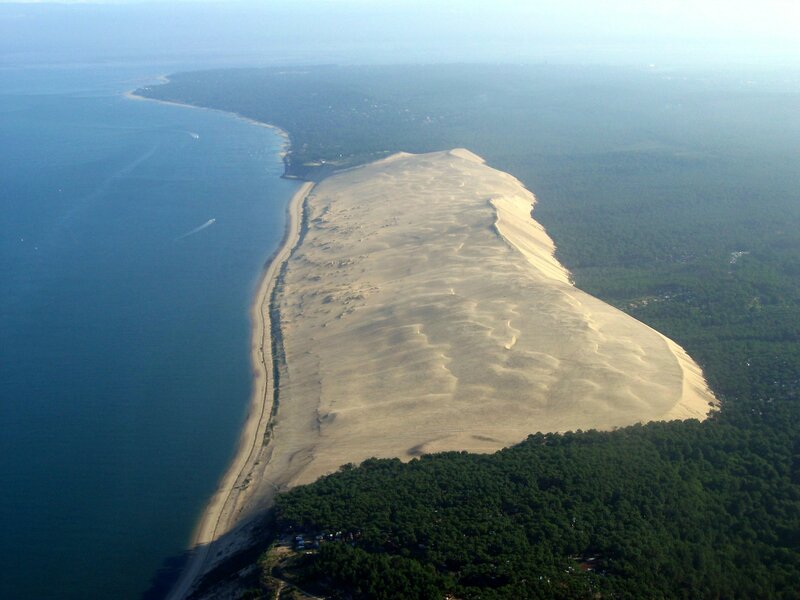 The Dune du Pilat is migrating all the time, averaging roughly 5 meters per year inland. Naturally, this means that it swallows trees, roads and houses slowly over time. Yes, there are houses buried somewhere beneath that great yellow sand monster. I’m from this place, and I never met the same impression until I went to Mexico, in the South-East, from the top of temples you see the same kind of green ocean .